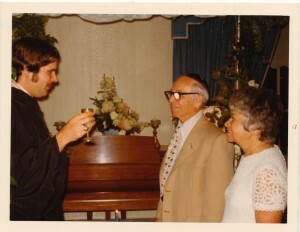 Around 1971, a couple years after my grandfather died, I heard my father was looking for a rabbi who would officiate over a wedding between my grandfather’s brother, Lew, and my Grandmother, Betty. The two of them were already in their seventies, the children of immigrants, raised Jewish in the early 1900s, which my sister and I supposed accounted for their not just living out their days together. I could tell this was a pretty uncomfortable moment for my dad because he sat me down and quoted a passage in the bible – something about a mandate issued by Judah to Onan to go forth and marry his brother’s widow, leaving out the part that this was for the purpose of producing offspring. Lew & Betty’s grown offspring — my father, his sister and his two first cousins — were already parents of grown children, who were not particularly friendly with one another, but were tied together in a family business that was successful enough to keep everything humming along. Here is a photo taken in my parent’s living room. Afterwards, there was a little brunch that broke up quickly without the usual air kisses and empty assurances that we would see each other soon. I didn’t think about it very much until a few years later when I mentioned it to friends in college. How weird must this have been for them both after full lives of loving or tolerating different spouses, knowing secrets, knowing what their former spouses thought of each other. Twenty years later, Lew’s son and daughter hired a big downtown law firm to sue my father and his other first cousin to dissolve the family business his father and my grandfather had created in 1928.